The Sphinx at Giza faces due east and is referred to in some Egyptian hieroglyphics as Hamachis, the god of the rising Sun. Later, Hamachis evolved into the name Hor-em-Akhet. The akhet is an Egyptian hieroglyph in the image of two triangles, both open at the base, connected by a line, which represents where the sun rises and sets—an image that comes to life when looking out from the Sphinx to the pyramids of Cheops and Cephren at sunset on the summer solstice. As the Sun sets between the pyramids, it highlights the image of two triangles (the pyramids) connected by a line (the earth). The Sphinx has the head of a man in Egyptian headdress sporting a spiraling beard, a feature found on many likenesses of pharaohs. It has the body of a lion, with two paws resting beneath the head and chest, and it rises 66 feet high; the leonine body at rest behind stretches for 240 feet. The Sphinx, the largest surviving statue from the ancient world, was sculpted out of a large limestone bedrock, a stone soft enough to yield to copper chisels and stone hammers, common Egyptian tools. The distinctive limestone bedrock has bands of yellowish clay—the same kind of distinctive stone that appears in many of the blocks used to form the nearby pyramids. It is generally believed that after the limestone bedrock was quarried for stone used for the pyramids, the remaining block was sculpted into the Sphinx. A sudden, 50-foot drop not far from the Sphinx might indicate an area that was quarried for the pyramids. reign, and since pharaohs were viewed as godkings, the association of Khafre and Hamachis is plausible. Tools and pottery discovered around the Sphinx are associated with the Fourth Dynasty, when each of the pyramid builders of Giza ruled. Nevertheless, the dating of the Sphinx remains a source of controversy, and even in ancient times, some sources dated it as preceding the pyramids. In Greek mythology developed over two thousand years after the Egyptian use of hieroglyphics, a sphinx was a half-woman, half-lion creature that guarded the gates of Thebes, an ancient Egyptian city. A scourge fell upon the land that could only be lifted by solving a riddle posed by the sphinx: What begins life on four legs, lives most of its life on two legs, and ends life on three legs? In Oedipus the King, a play by the Greek dramatist Sophocles (c. 496–406 B.C.E. ), the title character solves the riddle with the answer "a human," for an infant crawls on four legs before it begins to walk on two legs, then as an aged person, he or she walks with the use of a cane, or a third leg. In 1967, Herbert Ricke of the Swiss Archaeological Institute uncovered a temple at the foot of the Sphinx. Niches in the temple form sanctuaries dedicated to the rising and setting of the Sun, and a colonnade court in the temple features 24 pillars, which Ricke suggested represents the 24 hours in a day. The Sphinx, in Ricke's opinion, represents the Sun god that peers into the sanctuaries of the temple. The temple is situated on an east-west axis that points to the spring and autumn equinoxes. A second temple, constructed more than a thousand years later, is oriented toward the winter solstice. At the time the later temple was built, the Sphinx was buried up to its neck in sand and was called Hor-em-Akhet. The Sphinx itself forms an image of the akhet hieroglyphic when approached directly from Memphis, capital city during the Fourth Dynasty, when the pyramids and the Sphinx are believed to have been built. On the path from Memphis, the Sphinx appeared silhouetted between two pyramids. 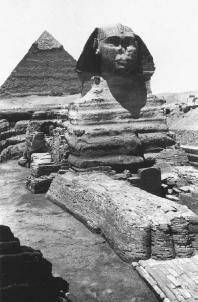 The question of the age of the Sphinx was renewed during the end of the twentieth century. An article in Omni magazine (August 1992) detailed the work of Robert M. Schoch, a geologist whose research demonstrated that the limestone core of the Sphinx dates from 5000 B.C.E. and indicated that granite facing was added at the conventional time when the Sphinx is dated, around 2500 B.C.E. Schoch attributes the extremely weathered look of the Sphinx to erosion that began with heavy rains from the period between 5000 B.C.E. to 3000 B.C.E. Schoch's dating is based solely on geological evidence, rather than information from hieroglyphics or other histories. E. A. Wallis Budge, R. A. Schwaller de Lubicz, and John Anthony West all wrote extensively on the monuments at Giza, and all date the Sphinx before the pyramids. West promotes a theory that an advanced, pre-Egyptian civilization was responsible for the Sphinx. He believes that much of the weathering took place because of rains and flood. West points to the period around 9000 B.C.E., when the end of the Ice Age may well have affected weather patterns. A great flood, perhaps the one recounted in the biblical story of Noah, affected the Sphinx, and afterward all the structures at Giza show erosion by wind and the slow but steady encroachment of desert. Schoch, a science professor specializing in geology at Boston University, was hired by West to explore the erosion of the Sphinx from a geological standpoint. During his first trip to Giza, Schoch noticed extreme erosion in two temples located in front of the Sphinx. Where the granite covering of the temples had slipped off, the exposed limestone beneath was extremely weathered. The granite facing suggested to Schoch that the Sphinx was restored, not constructed, during the reign of Khafre. Subsequent studies led Schoch to conclude that the Sphinx was constructed in stages and that the structure has undergone several restorations. The head and part of the body were originally carved as far back as 5000 B.C.E. The body was completed and the face restored by chiseling away weathered limestone during Khafre's reign. However, pushing the original date of the Sphinx to 5000 B.C.E. and attributing its erosion primarily to water creates problems, for that time period predates the development of mastabas, tombs that were built before the pyramids during the period between 5000 B.C.E. and 3000 B.C.E. and that show no signs of weathering because of water. Schoch's findings have been widely disputed by other geologists. 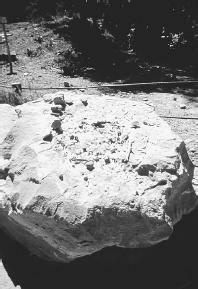 Since the limestone cannot be dated by modern techniques (radio-carbon dating can only be used to determine the age of things that were once animated), the age of the Sphinx continues to be considered in the context of other monuments, and the date of 2500 B.C.E. still holds weight among Egyptologists. Reconstruction is apparent, but evidence shows that a renovation occurred around 1500 B.C.E. as ordered by Thutmose IV, who had the Sphinx rescued from being buried by desert sand. John Anthony West argues that the Sphinx was created by refugees from Atlantis, the legendary continent that was supposedly destroyed around 9500 B.C.E. Graham Hancock and Robert Bauval, coauthors of The Orion Mystery (1994), credit wanderers from an advanced civilization that once thrived on the continent of Antarctica before it was frozen over during a global catastrophe at the end of the last Ice Age. Cataclysmic floods, they say, wiped out the connection of the Sphinx with an ancient, advanced civilization. Psychic Edgar Cayce (1877–1945) prophesied that answers to the mysteries of the Sphinx and ancient civilizations would someday be yielded by the Sphinx. According to Cayce, a secret passageway leads from one of the Sphinx's paws to its right shoulder where there exists a Hall of Records that contains the wisdom of a lost civilization and the history of the world. Darwish, Adel. "Sphinx May Disintegrate within 25 Years by Bungled Restoration." Independent News, March 18, 2001. [Online] http://www.independent.co.uk/news/World/Africa/2001-03/sphinx 18031.shtml. Ludvigsen, Freja. "Osiris' Grave Said Detected Near the Sphinx by Hawass Team." Translated by Stig Agermose. EkstraBladet, January 24, 1999. Was that what the real riddle said ? I'm into Ancient Egyptian story's and I bevlive that there is a tomb under the great sphinx. do you ? thank there is. I think the sphinx is a hell of alot older than everyone say for the simple fact is the empire of kush existed 36,000 to 40,000 thounsand years before a kemet was even founded oh egypt to western folks thank your greek folks for that they alphabet was a little cavemanish. But there was numerous happenings with nature still like today with mega tsunamis, typhoons, great volcano eruptions and earthquakes. So a great flood around 10,500 bce caused the water erosion of the sphinx. Oh yea there still is atlanteans alive well whats left of them. India is in the middle of ethnic cleansing of these people the people records show them coming to India exactly 10,000 years ago.